Sasha Says Nails... 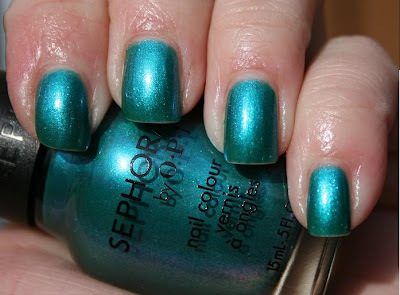 I'm a Manicure Momma: NOTD: Sephora by OPI Who Let the Dorks Out? The above swatch is 3 coats and I am officially in LOVE with this polish! The reason "peacock" is in the description is because there is a gorgeous purple shimmer that is somewhat hidden..... I could see it well last night when I was painting my nails in my bedroom, but in sun I just couldn't capture it on film. If you look closely at the bottom of the bottle in my pic, you'll find it- look real hard.... do you see it????? This is a must-have, as far as I'm concerned. Wow this is such a pretty color.I really like it. Love your blog! OMG, this color is stunning! It would be a MUST have if I actually had any money.